Cologne - Three clubs on the fringes of the European places lock horns with a triumvirate of sides fighting tooth and nail for Bundesliga survival on Saturday afternoon (kick-off 15:30 CET/ 14:30 GMT). TSG 1899 Hoffenheim will be hoping to return to winning ways against Hamburger SV after going down 3-1 at FC Schalke 04 last time out. The Sinsheim-based club have blown hot and cold since the turn of the year, amassing just seven points from as many games. That said, Markus Gisdol's men are still only five points adrift of the top six. We haven’t been in this sort of position, at this stage in the season, for a while," admitted the Hoffenheim head coach. "There are just ten games left and this is where it gets serious. We were all disappointed after the Schalke loss, myself as much as the players. We've talked about it this week. All our focus is now on the Hamburg game." The Red Shorts have fared marginally better than Hoffenheim this calendar year (W2, D2, L3), but continue to float dangerously above the bottom three. 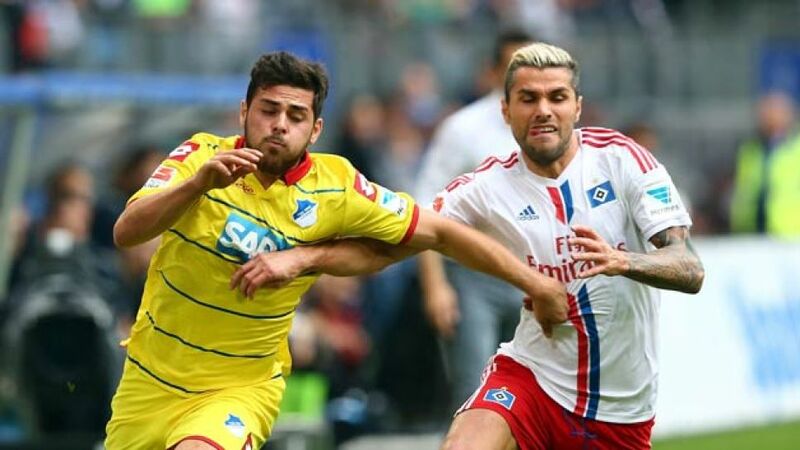 Just two points stand between Hamburg and relegation play-off incumbents SC Paderborn 07 and Josef Zinnbauer's extensive injury list is not exactly helping matters near the foot of the standings. Marcelo Diaz (hamstring) and Slobodan Rajkovic (knee) are definitely out of Saturday's clash, while Maximilian Besiter missed training on Thursday through illness. Rafael van der Vaart could be reinstated as a result and the 3,000 or so travelling fans could also be treated to the return of midfielder Lewis Holtby following a lengthy absence. FC Augsburg added another feather to their cap with victory over second-in-the-table VfL Wolfsburg last time out. The result came at just the right time for this season's surprise package following draws with Eintracht Frankfurt and Bayer 04 Leverkusen and defeats to SV Werder Bremen and lowly Hertha Berlin. "We've reached our goal for the season after hitting the 38-point mark, anything else will be a bonus," explained Fuggerstädter head coach Markus Weinzierl. "Now we have to go again. Mainz have got great individuals like , so we'll have to be on our guard [...] They want the points to avoid being dragged into a relegation battle." Recently installed 1. FSV Mainz 05 head coach Martin Schmidt is doing a decent job on that front. Since replacing Kasper Hjulmand on 17 February, the 43-year-old has overseen a 3-1 win against Eintracht Frankfurt and a battling 2-2 draw at third-placed Borussia Mönchengladbach either side of a 2-0 defeat to Hoffenheim, leaving the 05ers three points clear of the drop zone. "The defence is key for us," Mainz's tactical saviour told journalists at Friday's pre-match press conference. "We were obsessive against Gladbach and need to do the same in Augsburg. They're a team that win the ball back early and play the ball quickly, whilst being very difficult to break down. They deserve their position near the top." Frankfurt responded to that Rhein-Main derby reverse in Mainz by beating Hamburg, only to revert to type in last weekend's 4-2 loss at 1. FC Köln. Thomas Schaaf's men have had no trouble at all scoring goals this season, but they have struggled to keep them out (44 for and 49 against). The good news for Frankfurt fans is that their side are unbeaten in their last six matches on home turf, picking up 14 points (W4, D2) and scoring 15 goals in that time. Visitors Paderborn, by contrast, have won just one of their last 14 Bundesliga outings (D5, L8). "The attitude and battling performance we showed in the [3-0 defeat] to Leverkusen are the benchmark for the coming weeks," according to Paderborn head coach Andre Breitenreiter. "The main thing is that we don't make any mistakes." Personnel-wise, the Paderborn boss has a full squad of players at his disposal, save long-term absentee Thomas Bertels. Marco Russ is missing for hosts Frankfurt, though, with either Alexander Madlung or Bamba Anderson set to fill in at centre-half.